The Berkshire Visitors Bureau is the official destination marketing organization for Berkshire County and they provide info on Berkshire events, lodging and other activities. They work hard to bring new and returnining visitors to the Berkshires each year. The Berkshire Visitors Bureau turned to Studio Two when they needed to create a poster campaign to promote the Berkshires in Boston. The posters needed to not only make someone wish they were in the Berkshires but it needed to be engaging and interactive. Studio Two provided a library of photographs of the Berkshires, taken by Studio Two owner Kevin Sprague, and the many activities that take place here. Using 4 selected images Studio Two created posters showcasing some of the amazing things that draw so many visitors to the area. In addition to the posters Studio Two also created a mini mobile friendly website and attached customized QR (Quick Response) codes to each poster. 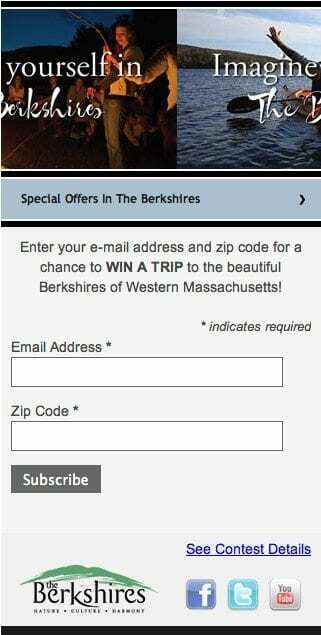 When these QR codes are scanned they direct you to the mobile friendly website where visitors were encouraged to enter their email address to be entered to win a trip to the Berkshires. The website also linked to some other offers and information.